Echonest – Death With Benefits – Single Review | The Ark of Music – The best music in the world…you never knew existed. Not long ago in Raleigh, North Carolina, Mike Lamardo (drums) and Warren Sharp (guitar) started jamming. Soon after, Keith Lewis (bass) was invited to jam too. And just like that, Echonest was born. All three members are also busy with other projects. 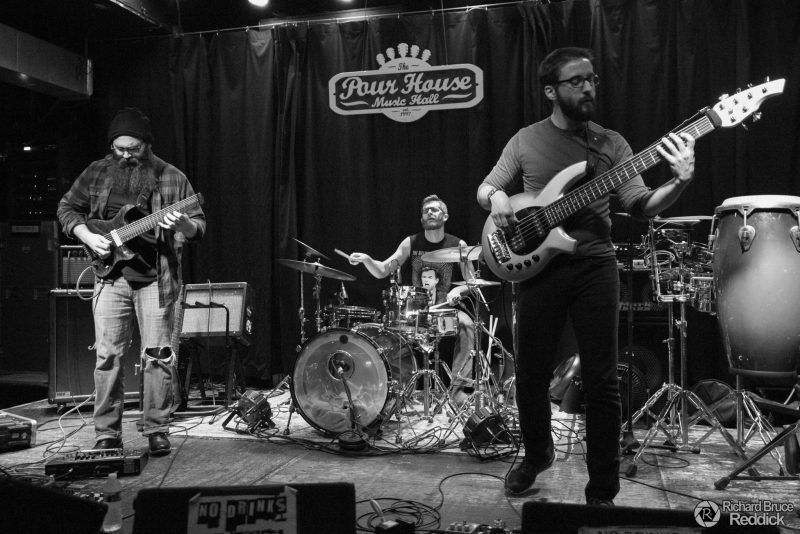 Mike plays in the psychedelic indie group, Zephranthes (recently released their third EP in January); Keith plays in the Pseudo Cowboys (who released an EP in 2015); and Warren has played in Stammerings (last releasing an album in 2015). Together, they’ve quickly created a small library of singles and EPs, including Let’s Rap, Live​@​Slim’s, and so much more. All of which bring us to their latest sonic alchemy, the effervescently jazz-chill, prog-o-fantastic seven minutes and thirty-six seconds of abstract melody known as, Death With Benefits. It’s as simple as it is complex: Electric guitar, bass & drum, all unite in a unique way to create something that is at times busy—but in a good way; and at other times soft and sparkly—but in a good way. (Yes, sparkles can be good—very good.) At 3:10 our journey goes from a light, airy dance to the equivalent of the dark side of the force and what might be described as a touch of jazz-metal. Once again, at about the 5:30 mark, the song breaks once more, traveling back to the good side of the force, where we are eventually sent on our way with a final touch of harmonics. At the very least it’s wildly interesting. At the very most, it’s just fantastic. 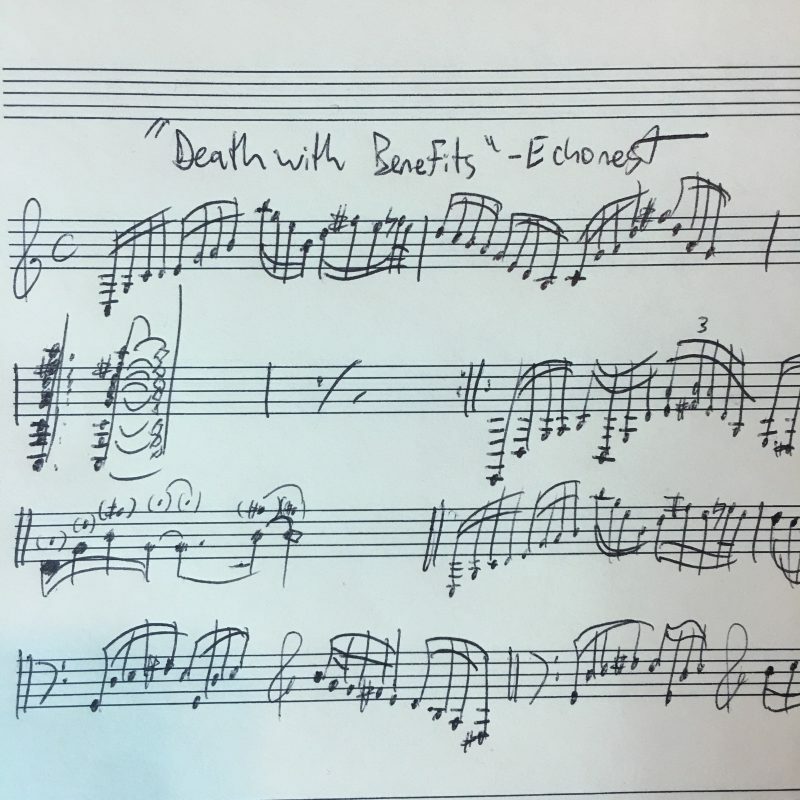 BELOW: Listen to Echonest’s new single, Death With Benefits, and connect with their website and social media platforms. Please support Echonest by visiting them online, and playing, downloading, and/or purchasing their music, or attending a live show! And, as always, thank you for supporting real music!